The accommodation for the trip was organised through Colletts Mountain Holidays and we based ourselves at the wonderful Sport Hotel in Arraba. The food is excellent but beware of the prices of the recommended house wines, stick to the Montepulciano d'Abruzzo, a good choice for the experto de vino! 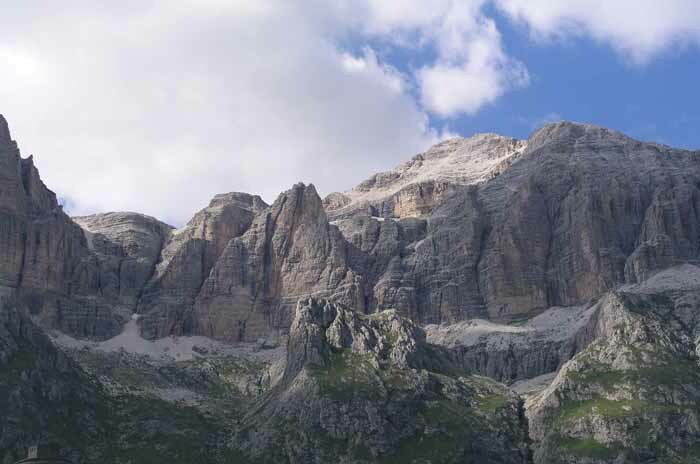 Two guide books were used on the trip ; Via Ferrata - Scrambles in the Dolomites by Hofler and Werner and Via Ferrattas - Italian Dolomites Vol 1 by John Smith and Graham Fletcher. The grades given are from the Smith and Fletcher guide. Further photographs are available here. A dvd of the climbs is available. The Porta Vescova cable car took us to the start of the short walk to the foot of the Via Ferratta. The mist was still lying on the mountain giving the steep first section of the climb an ominous feel. 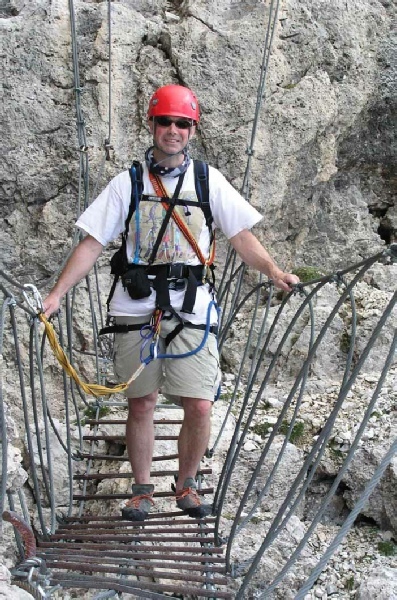 After putting on the climbing gear we set off up the first Via Ferrata. The route started with a strenuous section followed by a superb slab. 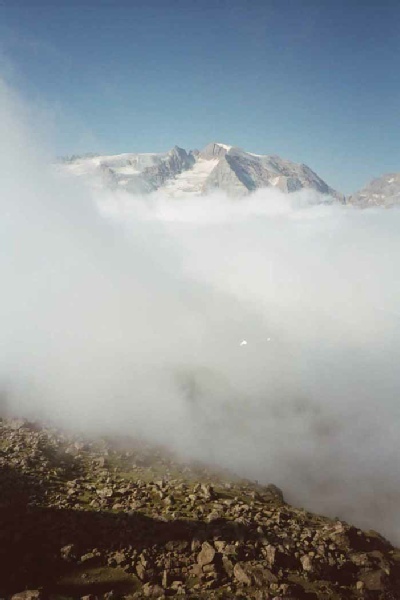 The mist began to clear to give brilliant views of Marmalada mountain across the valley and way down into Arabba. The ridge lead to a bridge and then a broad coll for a rest and some late breakfast. The rest of the route consisted of ledges, wartime buildings and some awkward descents. The route ended with a series of tunnels and then a final descent to the Rif. Padon for lunch. The path back to the cable car passed thorough some pleasant grassy slopes and gave a good view of the bridge that was crossed a few hours earlier. The cable car from the Falzarego pass took us to the top of Kleiner Lagazuoi,2728m. The route to the bottom of the Via Ferratta is not obvious but involved a climb down to the Lagazuoi pass and then a walk along the waymarked route 20. After changing to the Route 20B we continued along ledges then across a small saddle to take us to the first wire of the route. 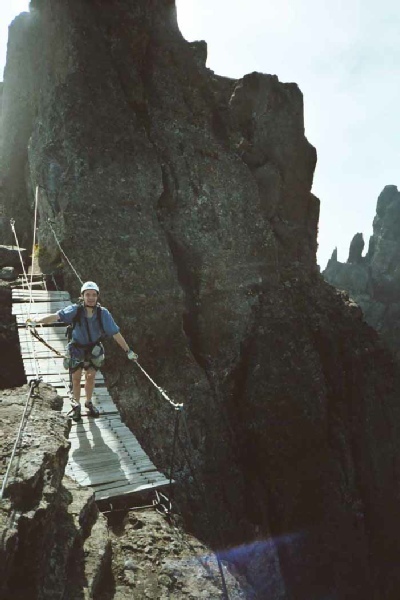 The route is characterised by finger broad ledges, walls with small holds and vertical corners. 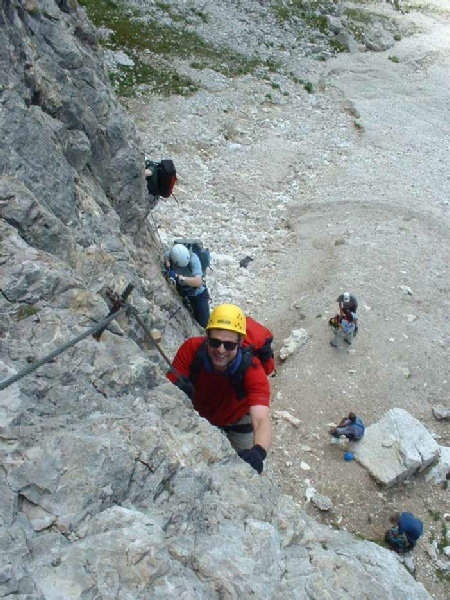 The start was steep and airy and we were soon traversing the famous nose of Tomeselli. The route continued up through a series of easy angled slabs to the steep wall leading to a wonderfully exposed slab and the summit. A short break at the summit was followed by a hasty descent as a thunder storm closed in around us. The descent was steep with lose scree, made all the more unpleasant by torrential rain and thunder and lightening. 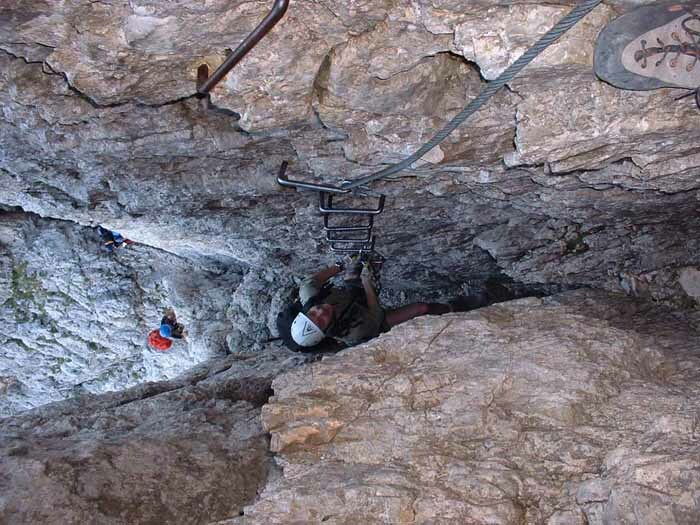 The route to Passo Falzerego was then taken and the famous First World War tunnels of Lagazuoi explored as a way of ascending back to the cable car. The massive slab of the VF Eterna was spotted on the traverse of the VF Trincee The car was parked at the Passo Fedaia and the short easy walk to the bottom of the enormous slab completed. The slab was easy angled and gave great climbing along its massive length. The angle steeped and the climb up to the ridge was extremely steep and exposed. The route along the ridge was lengthy and sustained with a number of difficult descents with stunning views across to the Trincee and towards Marmalada. 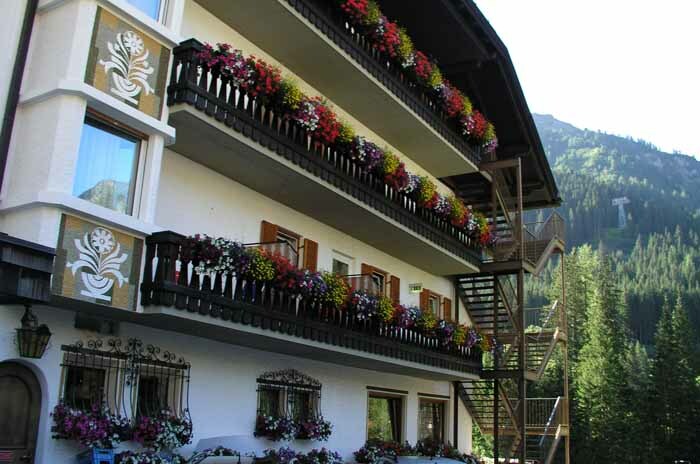 The cable car was used for the descent to Malga Ciapella and the walk back to the car. Highly recommended, a fantastic day was had by all! 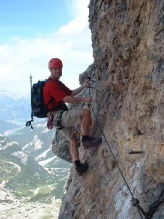 Reputably the hardest Via Ferrata yet constructed named in honour of the mountaineering author Cesare Piazetta. 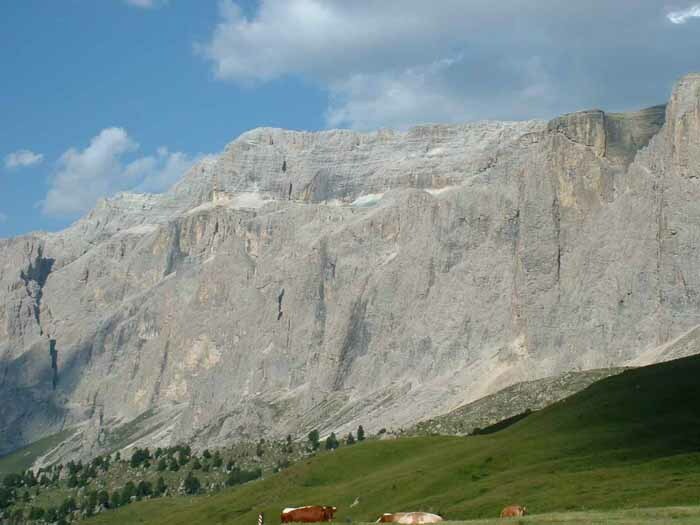 The start was from the mausoleum Ossario del Pordoi near the Passo Parodoi. The ascent to the foot of the VF was steep but a good warm up for the day. A number of parties were at the bottom so it gave us plenty of time to study the initial very steep 150m section of the route. Various techniques were used to get up this section ranging from delicate rock climbing moves to brute force and heaving on the wire. A big ledge gave us the chance to stop, relax and take on some refreshments. The famous wire bridge was then reached and gave a great photo opportunity. The ascent then continued up a series of well protected pitches in great situations. The top of Piz Boe was taken in on the way back to the cable car and the Passo Parodoi. An easier route after the previous days exertions. The wonderful Sasso Lungo gondola took us from the Passo Sella to the Rif Tony Demetz. 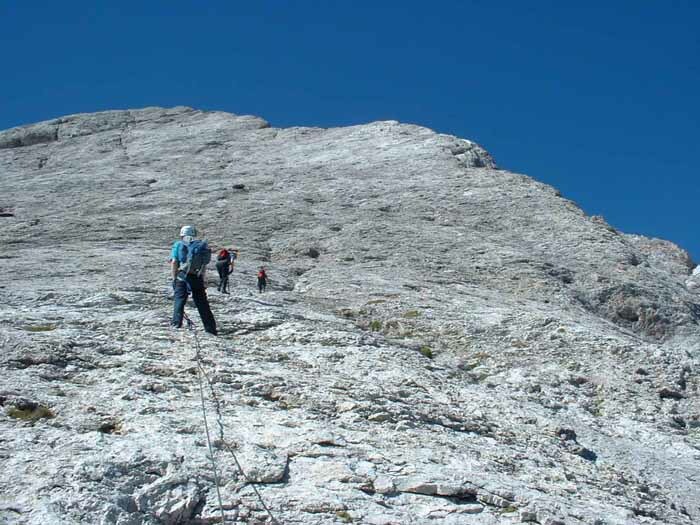 The start of the VF is high on the mountain and gave some fairly exposed scrambling on the way to the top of the Sasso Piatto. A pleasant way marked path took us back via the Rif Sandro Pertini to the car. A big mountain day with the ascent of the oldest VF, a walk across the Sella plateau and then a descent of the most popular VF. An early start saw us at the bottom of the VF in good time. The start was quite steep and lead to a gloomy chimney ascended by means of staples. 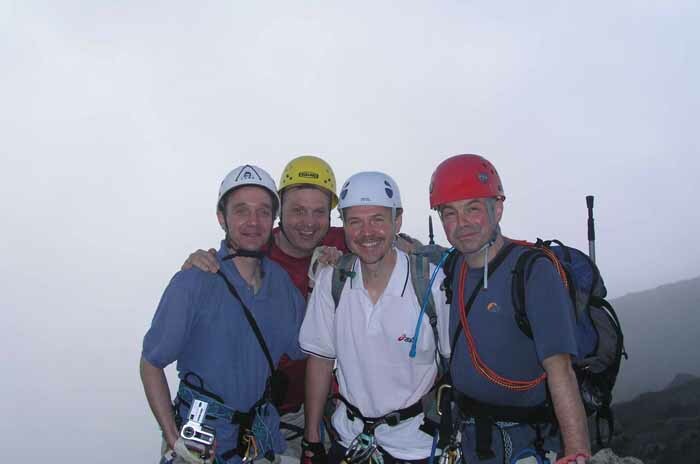 At this point we were overtaken by the German speed Via Ferrata team completing the route without any protection! The climb out of the chimney was exposed and exciting. 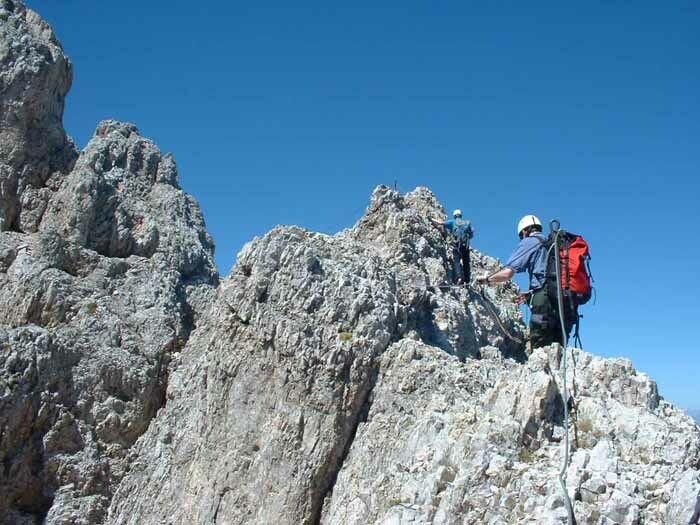 The rest of the route takes a series of craggy clefts towards the summit and the wonderful view of the Langkofel opposite and the snowy peak of Marmalada in the southern direction. In order to spice up the expedition we descended the VF Brigata Tridentina. The descent was delayed somewhat by a dramatic thunderstorm complete with rockfalls and the rescue of 6 Germans attempting to go up the VF in the middle of the deluge. A brilliant and truly memorable day, not to be repeated !